Original image uploaded by Kazu. 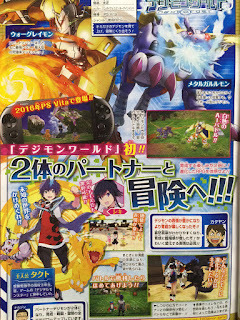 During the week of October 22nd, 2015, one of Weekly Shounen Jump's subsidiary magazines published a small page on the upcoming Digimon World -next 0rder-, focusing on the game's emotional portrayal of the player's two Digimon partners. By monitoring the Digimon's expressions as they occur in the field in real-time, the player can accurately judge their condition. Their Digimon will jump up and down when excited, or appear downcast when sad, giving them a strong sense of virtual life. 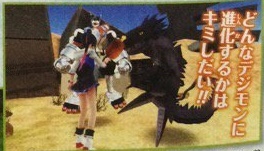 Although much of the content in the page overlaps with previous leaks, one new screenshot shows Shiki feeding a Gigadramon with a food item resembling one of the meats from Digimon World. -next 0rder- has repeatedly alluded to the return of virtual pet mechanics like feeding, sleeping, and keeping track of public toilets for the Digimon partners to make use of, but this is the first time the items the player uses in the game have been shown. The issue also shows Mach Gaogamon as part of Shiki's party, following up from Gaomon's debut. The total number of Digimon confirmed for the game so far is 40; the final roster will likely be between 200 and 300 Digimon, more than four times what was found in the original Digimon World. Digimon World -next 0rder- will launch on the PlayStation Vita and PSTV in Japan in 2016. Character designer Taiki did an interview about the game shortly after its original announcement in August.